We have all used or heard of many online resources (FamilySearch, Ancestry, etc) and the availability of microfilmed records of the towns and villages in Trentino. One source that may not be often thought of is the archives in the city of Trento, Italy, and the one in Vienna, Austria (we should all be aware that prior to 1919 Trentino was under Austrian control). These archives have hundreds of years of documents that have not been digitized or otherwise made available for remote or online research. Depending upon the period involved, the documents can be written in Italian, Latin, German, or Old German, and must be translated to be of any use. The most difficult to translate is the Old German since the script and wordage is generally not in use in these modern times, thus requiring the services of scholars or historians for translation. Even with these difficulties, the archives should not be overlooked. I was able to locate two documents at the archives. The first was a 1604 document written in Old German depicting the coat of arms (family crest) of a Job (Iob) family from the village of Cunevo. It is multi-page and contains drawings. I could not locate someone able to translate it, but was fortunate enough to find a transcription and a translation into Italian in a book about Cunevo. I had heard about this document and sent an inquiry to the archives in Vienna. I wrote the inquiry in English since I figured that there would be many learned archivists with knowledge of commonly used languages. The staff there was kind enough to locate it, and mail a copy to me. 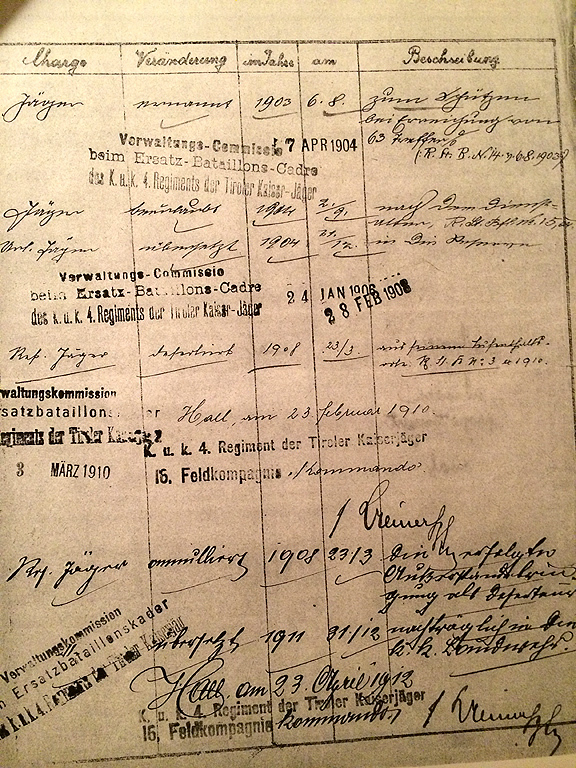 The second document (see left for one of the pages) was the military service record of an ancestor conscripted in 1901 and who served in the Austrian army. As we are aware,although culturally Italian, the people from Trentino were Austrian subjects and required to serve in that country’s armed forces. The military record was six pages, written partially in Italian and partially in German. It provided information with regard to my ancestor’s entry into the army, the unit with which he served, awards and decorations, personal description, fitness, reassignments, and discharge. This document was located at the Trento archive, and I enlisted the help of a researcher to locate the document and provide translations. Each of the sites has an e-mail address. If you know of the possible existence of official records (military, cultural, etc) for an ancestor from Trentino, try contacting either or both of the archives. Good luck. The province of Trentino recently released an online database of World War I casualties. The database is basically a listing of soldiers from Trentino who entered the Austro-Hungarian army during World War I and were killed in action or otherwise became casualties. The database can be accessed and searched at “Ricerca caduti trentini della I guerra mondiale” (will open in a new window). If you heard family stories or rumors that an ancestor or relative died in World War I, this is the place to try and verify that information. Once you access the site, click on Cerca nella banca dati. A series of boxes will appear. The boxes are: Cognome e nome (last and first names), Luogo di nascita (place born), Luogo di residenza (place lived), Luogo di morte (place died), Luogo di sepoltua (place buried). You can search by any or all of the fields. Sometimes it is easier to simply search by last name or village (if not a large city). 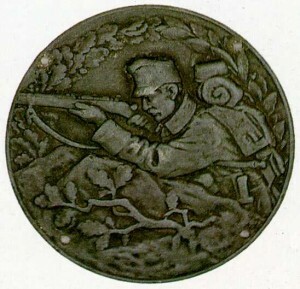 More than 11,000 persons died as a result of military service. The information contained in the database can be as little as a name and year, or can contain information such as date of birth, date of death, parents’ names, place died, place buried, occupation, military specialty, military rank, and possibly a photo of the person. Example — I entered the village of Cunevo in the luogo di nascita field, with 11 persons listed. Information about a Carlo Iob was shown, including the fact that he was born in Cunevo in 1894, was single, died in Vienna in 1917. Information about an Angelo Zanon stated he was born in Cunevo April 11, 1893 to Giuseppe Zanon and Maria Zadra. He was single, a student at the time conscripted, and died December 13, 1916 at Tonale due to an avalanche. He was a sergeant, and awarded the Iron Cross of Valor. I did the same for the village of Flavon, producing 24 persons from the village who died during the war. Information for an Ottavio Iob contained his photograph and stated he was missing in action. Some of the information showed that a few of them died in prisioner of war camps in Russia. The database can be of use in filling in blanks in your family or siblings of grandparents and great-grandparents. Good hunting. Many times, wandering around the internet searching for resources to help me in my research, I come across a site that may be of interest to many of us researching our Trentino heritage. One such site is Rouse1906. This site is a resource that strives to document and share the heritage of the men and women who worked the Colorado coal fields in the early 1900’s. Although the majority of the site is dedicated to the coal fields at the Rouse coal camp, the stories and experiences of those miners are very comparable to the stories and experiences of our ancestors who worked the coal mines in other parts of Colorado. Due to the mobility of the workers, many names in the author’s database can be found in several different mines in Huerfano/Las Animas. The purpose of the website is to be a platform to collect information from descendants and make that information available to others. The author’s great-grandfather emigrated from the Trentino village of Tenna, and travelled to Walsenburg, CO to work at the nearby coal mines. He worked, as did many of our grandparents and great-grandparents at coal mines operated by the Colorado Fuel and Iron Company. The author, through stories, documents, and photos, details the history of the CF&I, the coal camps, and the people who lived and worked at the mines. Many of the comments he makes are similar to the stories I heard of my grandparents’ experiences at the CF&I coal mines at Hastings (Las Animas County). Rouse1906 represents a project to collect the common memories of thousands of immigrants who worked the southern Colorado fields in the early 1900’s. It is open to suggestions and contribution of everyone with a story to tell, a picture to share, a memory to preserve. Rouse1906 is well worth visiting and may trigger some of your memories or ideas for research. There is a resource to find names and other information about actual persons working and living in southern Colorado during the 1890’s to 1920’s. The city of Trinidad, Colorado, which was a major stopping point for our ancestors on the way to the coal mines, has placed city directories online for those years and more. 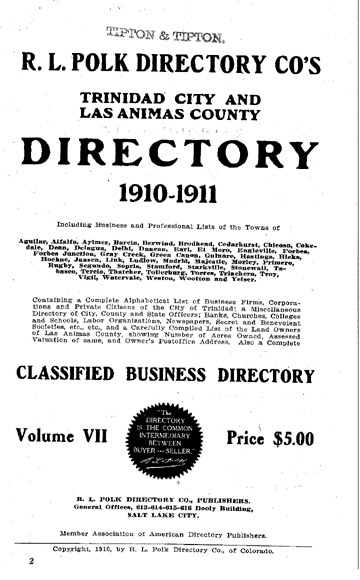 These directories, which can be more than 200 pages for each year, are available for download in pdf format can be found at Trinidad City Directories. Of particular interest are those for the years 1899 – 1916, which were the years during which large numbers of emigrants from Trentino went to Colorado. Emigrants bearing names of Bacca, Casagrande, Dalsass, Fedrizzi, Fellin, Flaim, Franch, Melchior,Menapace, Moser, Yob, Zanolini, Zanon, and more. Not all emigrants are listed. Although I found my grandfather’s brother, sadly my grandparents are not listed. Specific persons include: Peter (Pietro) Bacca from Flavon, who owned several businesses, including a wine dealership, and hundreds of acres of land. He emigrated to Colorado in 1884, first appeared in an 1895 Hastings directory, and operated a dry goods store there in 1918. Persons bearing the surnames of Dalvit, Franch, Pedron, Ruffini, and Tretter were laborers at various mines. During 1903, Abramo Menapace was a laborer at the Victor Fuel Company coal mine in Hastings. As were Emanuelle, Modesto, and Frank Yob. Frank Menapace was a saloonkeeper in Segundo, as was Arturo Menapace. Abramo Menapace also owned property in Ludlow, assessed at $1025, while Frank Yob owned 267 acres in Segundo assessed at $1105. Reviewing all these directories can lead to new information about our ancestors who worked, lived, and died in those coal mines so long ago. It will take a while to go through all the pages of each directory, but the time spent will give us some insight to those times. A large portion of Italian genealogical records write dates numerically rather than spelling out the calendar months. For example, we will see a date written ” 4-8-1826″. Interpreting this to our way of thinking in the US, we happily enter April 8, 1826 as the date of the birth, death, marriage, etc. Unfortunately, that is not the case. Most European records are written day-month-year rather than month-day-year. Thus, “4-8-1826” is actually 4 August 1826. If you do see these references for dates, then congratulations — you have found records that are likely a few hundred years old. Hopefully they are of your family heritage. It has been quite a while since I last posted – I guess getting out in the sunshine and enjoying the fresh air and scenery takes precedence over sitting in front of a screen. Some of my previous posts suggested using published books to learn about our culture and heritage — Researching Ancestors Through Published Books. I suggested reading “A Courageous People From the Dolomites”, by the late Bonifacio Bolognani. This book is considered the definitive treatise on emigration from Trentino to the United States. It discusses why our ancestors left Trentino, how they traveled, where they went, their lives in their new country, working in the mines of Colorado, Pennsylvania, and elsewhere. Of particular interest is the mention of many hundreds of names of emigrants to the US. Upon clicking to read the book, you will be presented with a small version of the pages — click on the page to see a larger readable version. Additionally, you can print pages of interest, or entire book (if you have about 500 sheets of paper available) or download it to your computer for later reading and reference. Again, I cannot emphasize enough the importance and usefulness of this book in understanding what our ancestors went through. Many many thanks to the Department of Emigration for making this book available to everyone. Rallo c. 1885 arrived in 1900 and found work in the Colorado mines at Trinidad and Radiant. 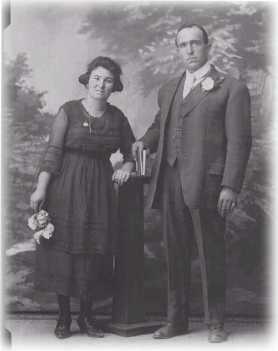 Carlo eventually married Josefina Valentini, a native of Rallo, in 1911. Unfortunately Josefina died about a year later. In 1920, Carlo married Josefina’s sister Carlotta. An enterprising woman, she traveled alone from Rallo to New York by ship, and then to Trinidad, Colorado by train. As was common with many of our ancestors who arrived from Trentino during that period, Carlo’s life was one of many ups and downs — illnesses, business booms and business busts, hard living, uprooting family, and new beginnings. Carlo’s daughter Theresa Pinamonti Zeigler tells the story of how Carlo and his family met the challenges of coming to a new place, not knowing the language, but yet overcoming many challenges and finding success and fortune. His story, The Immigration of Carlo Pinamonti and Carlotta Valentini shows how persistence can overcome discrimination, strife, and the other obstacles put in front of our ancestors. Read it and see how these pioneers from Trentino provided us with what we have today. Much historical and useful information can be learned by researching old books about our ancestral villages. Also highly useful is contacting (and hopefully receiving a reply) the municipal offices in the villages, and trying to find living descendents of a common ancestor. Although many of us in the US are interested in our ancestry, we commonly find that persons in our ancestral villages are not — they are living their ancestry, while we are trying to discover it. Much of the information below was discovered not only by using microfilmed church records, but also by making contact with distant family and their friends in my ancestral villages, and establishing relationships with people in Trentino I met online. Additionally, there are quite a few online booksellers that deal in foreign books. The name IOB is apparently derived from the Biblical “Job” (Giobbe in Italian). At times, the name was also used as a first name, as in Job de Job. Although the most common spelling is IOB, the Latin version JOB is very frequently encountered, especially in the civil records of the 15th to 17th centuries (during this period, the church was the maintainer of the civil birth, marriage, and death records). Today, both versions are commonly used in Trentino. Most emigrants to the US had the spelling changed to YOB as a result of the manner in which the name was pronounced (the letters “I” and “J” were pronounced as if it was the English letter “Y”). Due to the presence of many different branches (or clans) of families with the same last name, there were a large number of marriages where both husband and wife had the same last name. In addition, there was a limited variety of first names (Giovanni, Giusppe, Giacomo, Francesco, Maria, Anna, etc.) in use. Many of us have already encountered the difficulty of trying to find the right ancestor among the many with the same first and last names. In order to keep track of marriages and relationships between persons with the same last name it was very common to add a second name known as a “sopranome” (nickname) to the different family lines. The sopranome was used in order to distinguish the different lines from each other, and in many instances, is the only means to determine the person referred to in a document. For example, some of the sopranomi for the IOB families in Cunevo are –perotel, -bottes, -sicher, -brun, and –remus. My IOB branch was known as IOB-sicher. Sicher, of Middle-High-German and Hebrew origin, is derived from the Latin “securus”, meaning “safe” or “certain”. The Sicher name itself is found in area Medieval records, e.g. there are references to a Sicherius, who was a priest in Flavon and attended a Diocesan Synod in the year 1336. Sicher is also a common surname found in the Val di Non village of Coredo. The earlist reference that I have found to a specific person using –sicher is Joannes de Sicheriius de Joppis in 1553. Is this the derivation of the –sicher in my family line? Unfortunately, I don’t know. Although there has been a IOB family presence in the villages of Cunevo and Flavon since the early 1400’s, the earliest I have been able to directly trace my Sicher line is to Gio’ Batta IOB-sicher of Cunevo, born circa 1739. There was a noted Job family (descendents of whom are still in Cunevo) known as de Job. This family was of the rural noble class, wealthy, and had many highly placed members. Rural nobles are not nobility, but rather members of a privileged class entitled to special respect, wealthy, and exempt from many of the taxes and duties that the other villagers had to bear. The de Job line has been partially researched to 1409, and during the late 1500’s and early 1600’s members of this branch were granted a coat-of-arms. The coat-of-arms was granted on behalf of the Emperor of Austria, to whom members of this line performed valuable services during the Rustic War of 1525 and thereafter. Based upon family stories, I am directly related to this line too. However, I have not been able to locate any documentary proof of this relationship. Tracing my –sicher line further back or directly linking to the de Job line will be difficult due to the destruction of the church records in an 1802 fire. The Trento state archives contain the records of the “notaio” (notary) Giovanni Cemi from Tuenno. 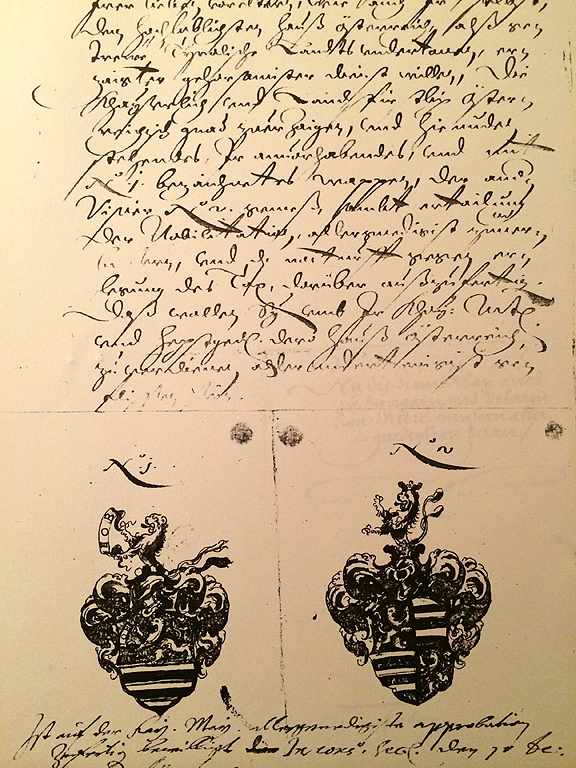 These records document that on 1 June 1671 in Cunevo, Elena, the widow of Sicherio Job assumed custody and responsibility for their minor son Giovanni Giacomo Job-sicher. The notarial records at the Trento archives also refer to a Francesco Iob-sicher, who on 18 July 1751, assigned an income or “wealth” of 35 Ragnesi to the church of S. Giovanni Battista in Flavon. The document was signed in the house of Pietro Pasqual, who along with Giovanni Battista Dolzani of Flavon, acted as witnesses to the signing. Although there is an almost certain relationship to the Iob-sicher persons mentioned above, I have not been able to document it, and likely won’t be able to. 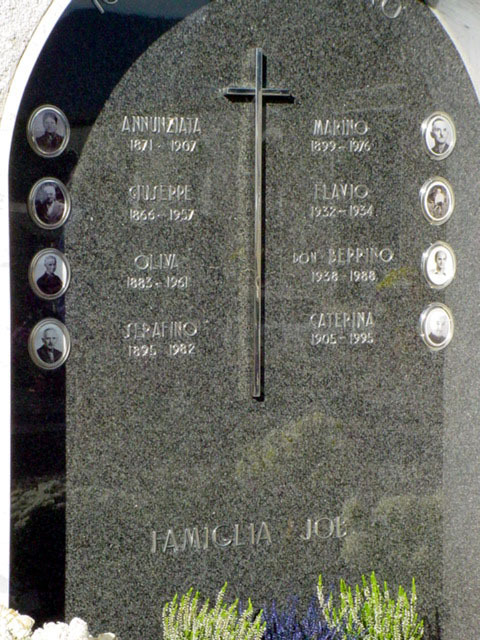 Sometimes it pays to think “outside the box” — it is common in Italy to have photos of the deceased on their tombstones – one way to find a photo of a deceased ancestor. For example, here is one found in a Cunevo cemetery that was forwarded to me by a distant cousin I met via the internet (thank you Franz Job). Storie di Emigrazione in Val di Non – Cagno, Revo, Romallo, Cloz e Brez, (History of Val di Non Emigration – Villages of Cagno, Revo, Romallo, Cloz and Brez) is a new Facebook page. Started in April 2013, it is a meeting place for those of us interested in emigration from the aforementioned villages to the US, Brazil, and Argentina. The page currently has a few stories, links to YouTube videos dealing with emigration from Trentino, old photos with many people in them, photos of the tools and machinery used by our ancestors, and music of Trentino. Whether you love or hate Facebook, we have to admit that it is a good source of making contact with others sharing our heritage. One I use regularly is Val di Non Storica — although most of the comments are in Italian, the part of special interest is the hundreds of old photographs and picture postcards of villages in Val di Non, such as Cavareno, Fondo, Ronzone, Cles, Romeno, Segno, Revo, etc. You will be required to join Facebook and the Val di Non Storica group (both free) in order to access the photographs. If you have a story of your ancestors’ emigration from any of the villages listed, feel free to add it – or let me know if you would like it posted here. Thank you Giovanni Rigatti for telling me about the page. I just received information about a website devoted to emigrants from Baselga di Pine, which is northeast of the city of Trento. The website Mattivi Family Historytraces the origins of emigrants from Baselga di Pine to Novinger, Missouri, Silverton, Colorado, and other areas. In addition to Mattivi, names include Anesi, Andreatta, Giovannini, and Casagranda. A brief history of surname origins, facts, surname distribution, documents, and photos are provided. Well organized, the site is useful not only to those of you with origins in the area, but also as a model for how to obtain information and organize that information.